As Rochester’s hub of lifelong science learning, RMSC is essential to our region’s science infrastructure and culture of creativity. Inspiring young people is in our DNA! Our hands-on, minds-on experiences empower children, teens, and adults to explore science and technology further, and with your help we’re able to encourage even more discovery. Your tax-deductible gift will help us continue to inspire the young and the young at heart. ...but to him, it seems like yesterday. He was 15. He had just moved to Rochester from Puerto Rico with his mother and brother. He did not know anyone. As a boy growing up in Puerto Rico, Christian tried to take photos of the moon using a telescope and a flip phone to satisfy his curiosity about the night sky. Sensing his longing for something familiar in his new hometown, a school social worker encouraged him to pursue that passion using Rochester’s night sky. It was Christian’s first Rochester winter, so the social worker brought him indoors to the Planetarium, where he met Steve Fentress, Planetarium director. Steve doesn’t speak Spanish and Christian didn’t speak English, yet the two were able to communicate because of the shared language of science. Feeling as though he found a community in his new city, Christian began visiting the Planetarium as often as possible. 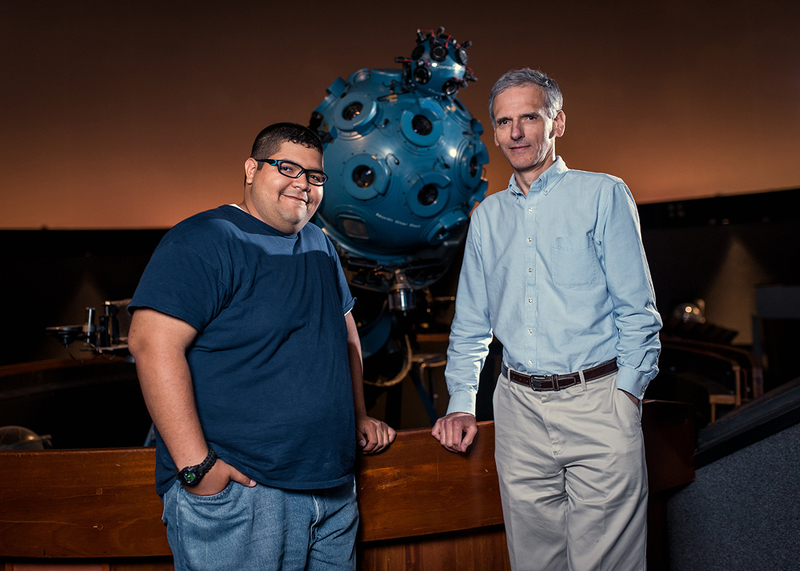 His visits piqued a new level of curiosity in astronomy and inspired him to learn English. As he approached his early twenties, Christian wasn’t able to spend as much time at the Planetarium, but every visit was like a homecoming. Today, Christian is a photojournalist for an NBC affiliate in Rhode Island. In his free time, he still snaps photos of the night sky. When he does, he fondly remembers his time at the Strasenburgh Planetarium with Steve, whom he credits not only for helping him develop the skills needed to become a first-class photojournalist, but more importantly, for encouraging his passions. Through a contribution to our 2018 Call for Curiosity, you can help us continue to spark curiosity and inspire innovation. Who are we and who do we serve? Here's a snapshot of our impact. 5 million+ people have seen the stars at the Strasenburgh Planetarium since it opened in 1968. 6,400 RMSC members across Western N.Y.